Let’s start off with a little background info. 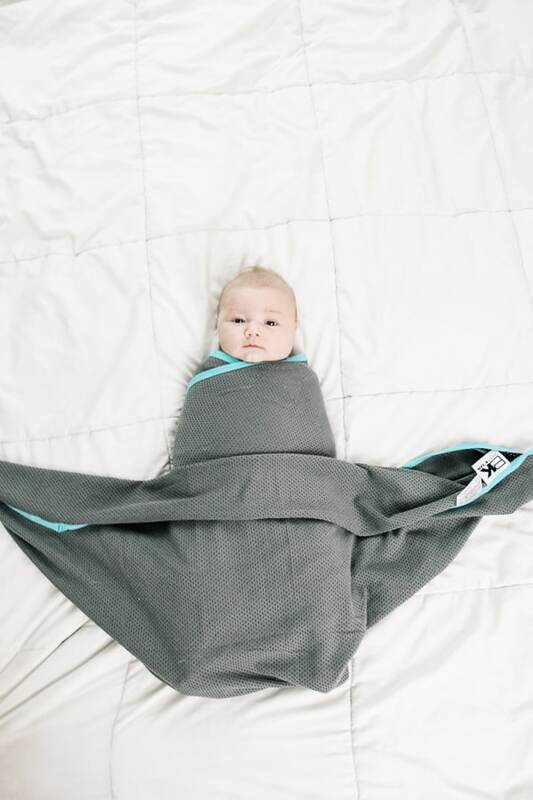 Why do newborns need to be swaddled? Swaddling is an important aspect of newborn life. It creates a cozy environment for a baby that helps them feel safe, secure and like they are back in the womb (the only home they have known for the past 9 or so months!). Babies are born with different reflexes that influence how their body moves and responds to stimuli around them. The Moro Reflex, also known as the startle reflex, is the baby’s natural reaction to stimuli that makes them feel like their body is undergoing a drop, direction change or other sensory experience. In simple terms, it is like a newborn feels like he/she is doing a freefall, and so they spread out their arms and legs in an effort to catch themselves. Babies are born with this reflex, and it typically lasts through the first few months. It is a sign of normal, healthy development (which is why it is one of the things your child’s pediatrician will check for). While it may be cute to watch, it makes them feel less secure and can wake them up repeatedly at night. And nobody wants that! And that is where a swaddle comes in! 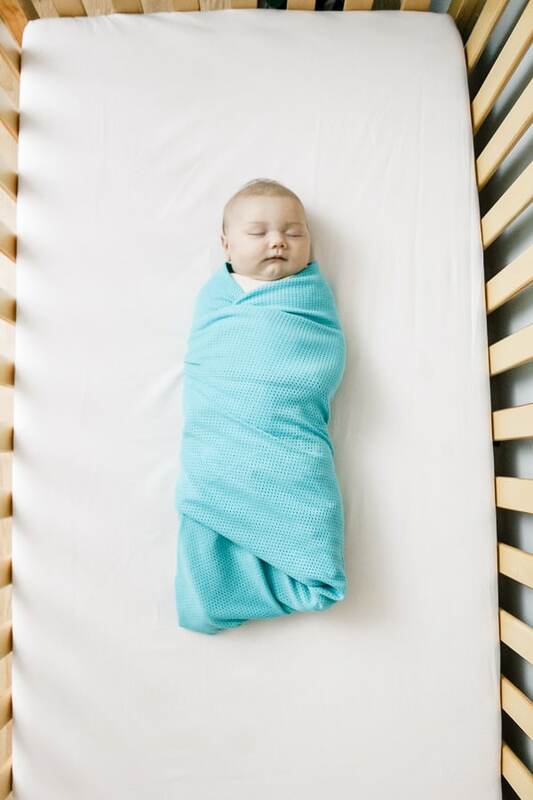 Swaddling helps combat the Moro Reflex during sleep as it restricts an infant’s movement and does not allow the limbs to flail outwards to the same extent as without a swaddle. 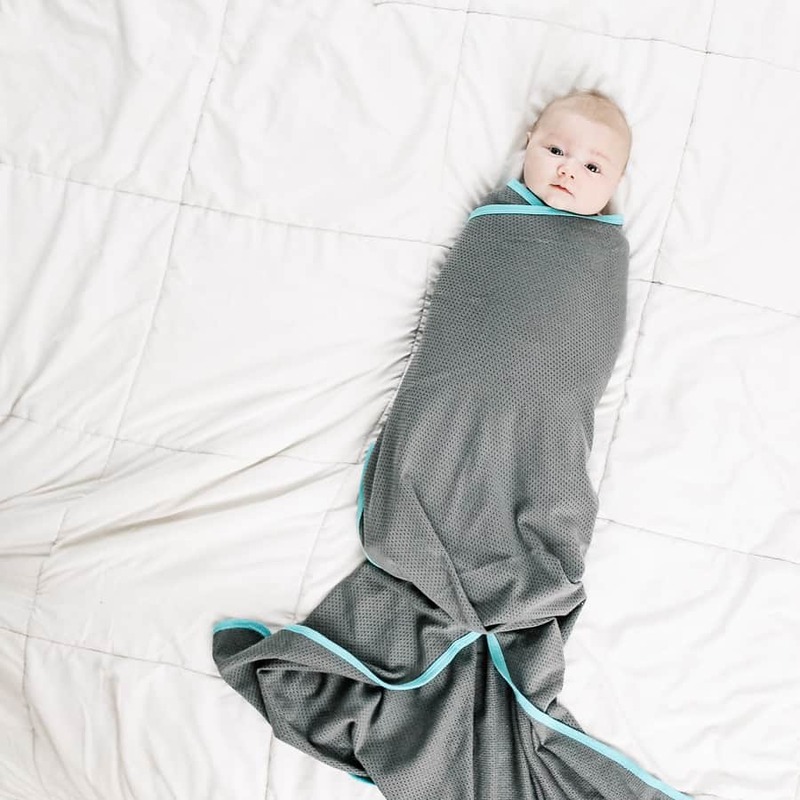 Though babies are able to move around to some degree inside a swaddle, if the Moro Reflex is activated by outside stimuli, then the material quickly stops the thurst of arms and encourages them back towards the body, helping to keep them asleep. 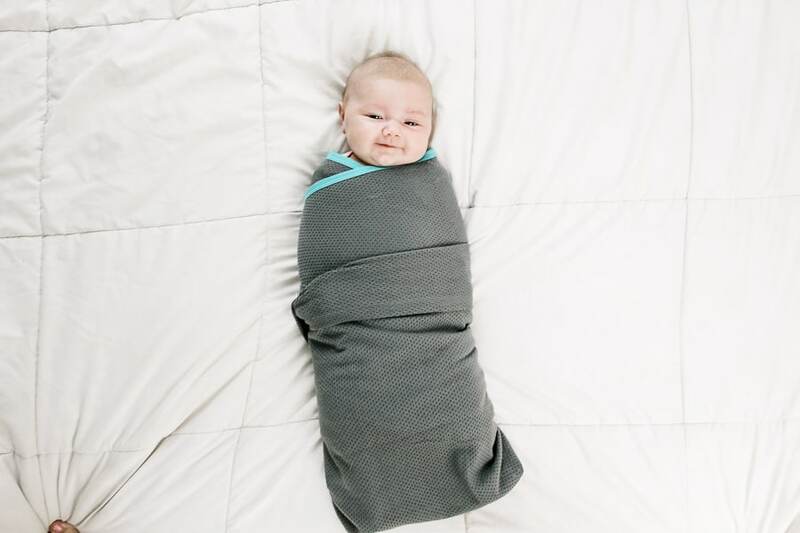 While it should be noted that not all babies like to be swaddled (or it might take some trial and error to find the right wrap or style that works best for them), it is beneficial for most babies to be swaddled for at least some part during the 4th trimester. 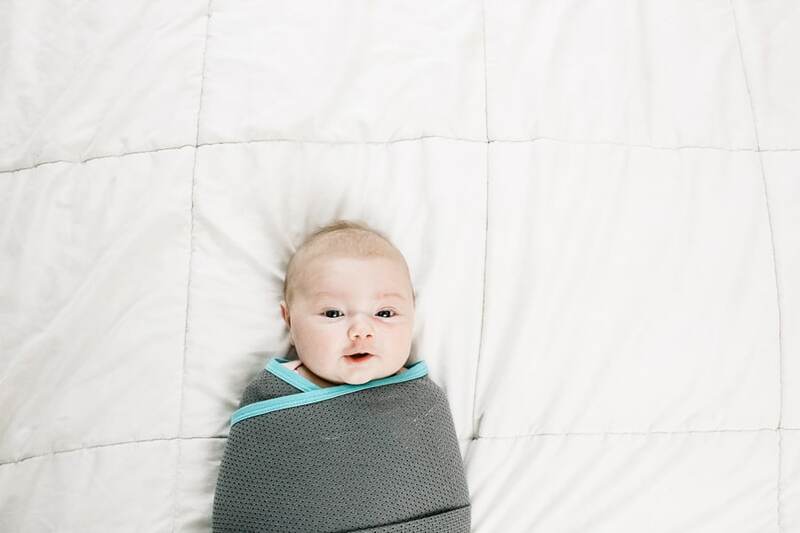 So now that we’ve covered why babies love to be swaddled (and why parents love the sleep that it can bring), we can do what you actually came to figure out—how to swaddle a baby! Swaddling a baby with a swaddle blanket—why everyone should learn how! 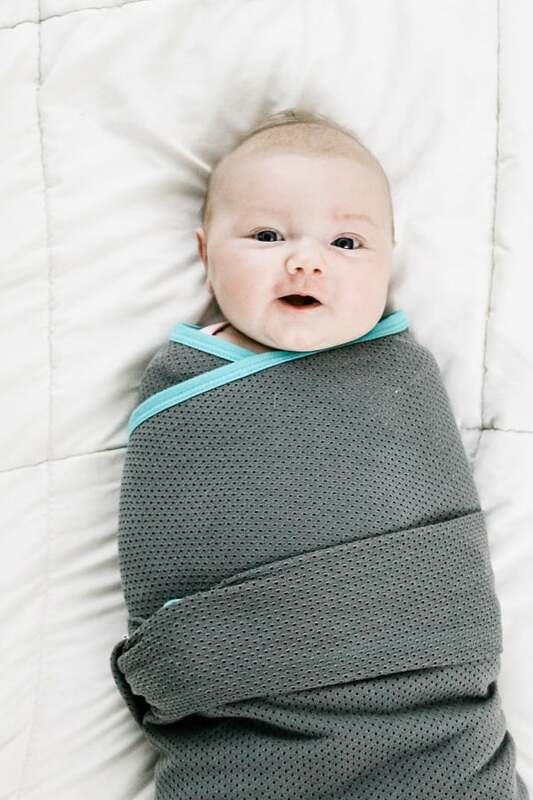 There are many different ways to swaddle a baby and many different types of swaddles on the market. I have used and loved many different ones, but absolutely believe that every parent should learn how to do a basic swaddle with a blanket. It’s because it is so convenient! Think about a time when you have been in a rush to answer the door after a shower and need to throw clothes on. You grab whatever is nearby and available! Swaddles are the same. Even if you own dedicated swaddle sacks, I can’t tell you the number of times mine have all miraculously been dirty or in the laundry when a baby just won’t be calmed without it. Plus many of those have Velcro or zippers that can make noise and disturb a newborn. Blankets are much easier to find when pressed for time, and since they are multipurpose, carrying a swaddle blanket in your diaper bag means you can make a quick swaddle (plus turn it into a carrier cover, burp rag, and playmat) anywhere you go. Learning how to wrap a baby in a swaddle blanket is key for quiet wraps and better sleep. *A note about clothing: Babies should be dressed for sleep taking the room temperature into consideration. Depending on the season/temp, a onesie, long sleeve onesie (with or without pants) or footie pajamas all work well. 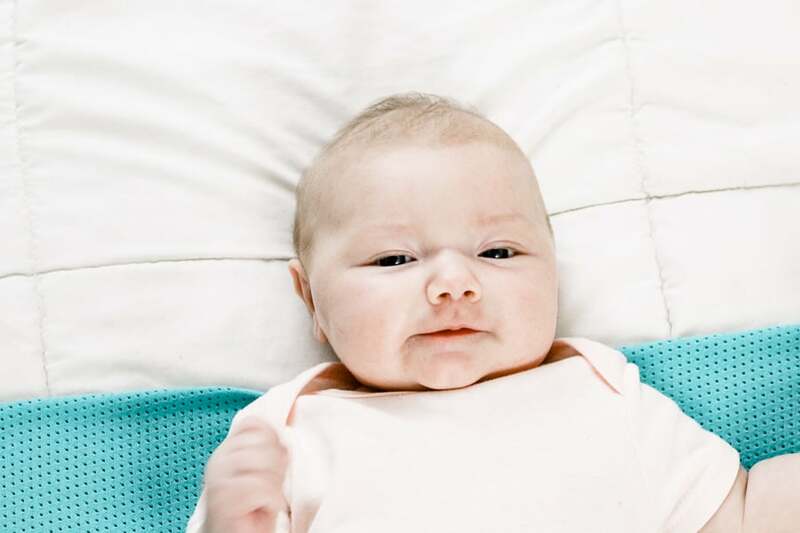 It is important that they do not overheat while sleeping to prevent SIDS, as well as general discomfort during sleep, leading to more wake-ups. Step 1: Gather together a cute baby, and a swaddle blanket. 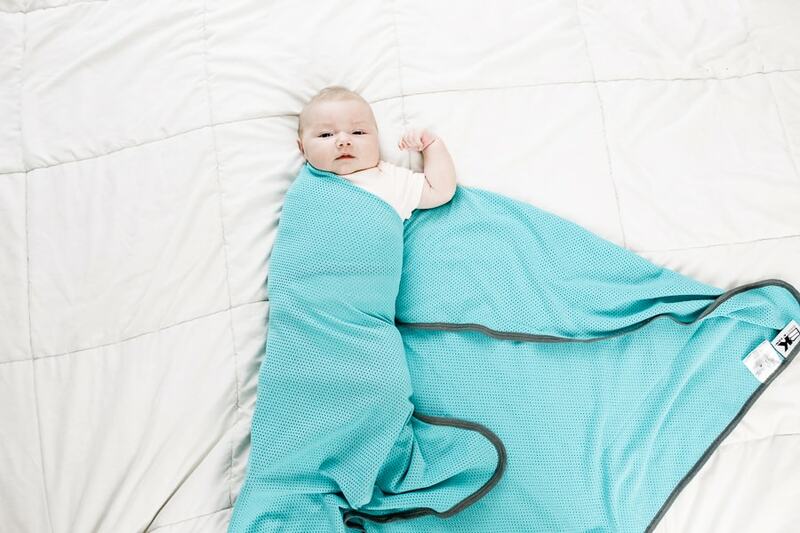 I love using the Baby K’tan Swaddle & Toddler Blanket as they are generously sized (42″ x 42″) and made of a breathable cotton-mesh to prevent overheating. Step 2: Lay the swaddle down in a diamond shape, and fold down the top corner. 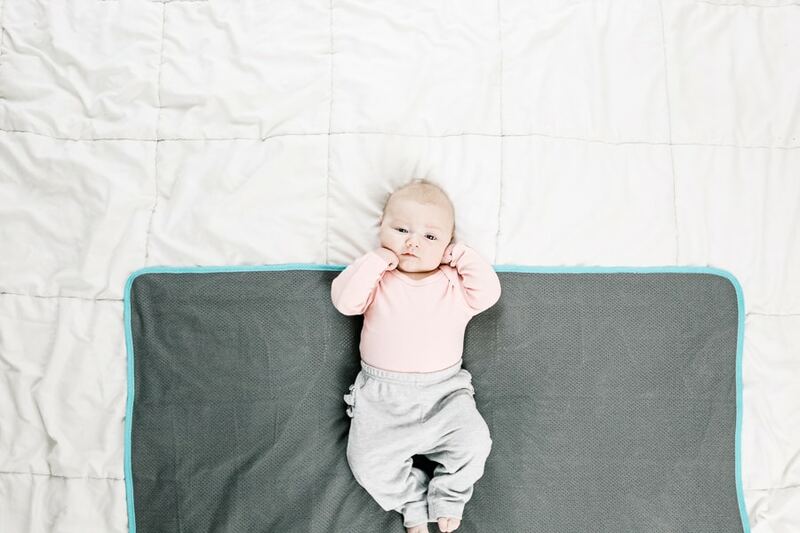 How much you fold will depend on the size of your baby and the size of the swaddle, but will generally be around 4-8 inches. The more you fold, the smaller your swaddle becomes. 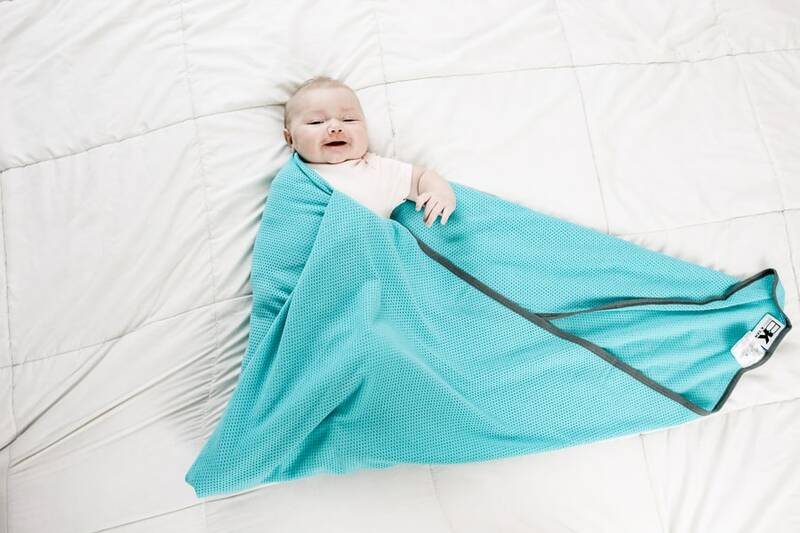 After trying the full swaddle process out, you will be able to tell if you need to fold more or less to get the right amount of blanket to make the swaddle wrap perfect size for your baby. Lay the baby on top of the folded section, with their shoulders at the line. Step 3: Take the left corner of the diamond shape, and bring it over the baby’s chest while holding the baby’s arm to their side, and tuck it securely under the baby’s back and bottom. Leave room for the legs to move and assume a natural position. 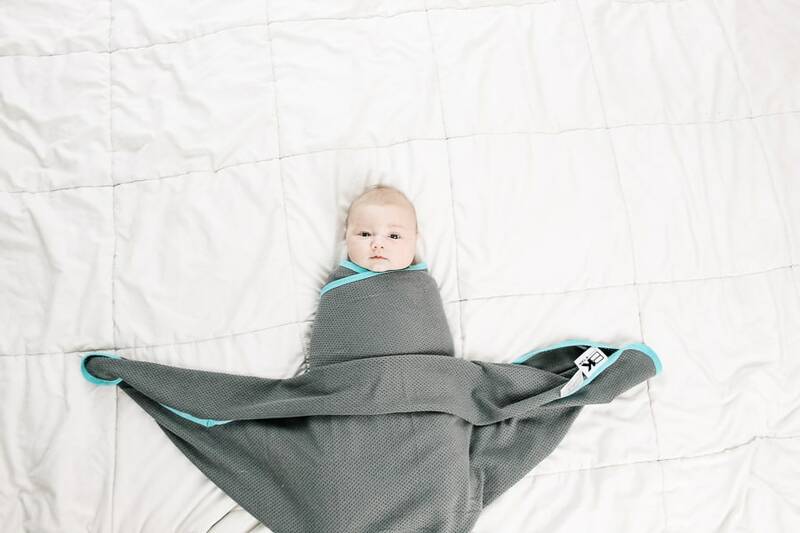 Make sure the swaddle is not covering the baby’s face, or that it is too loose. Stop and take a picture when baby flexes her bicep because it is just too cute! Step 4: Bring the bottom corner up towards the opposite shoulder, and tuck in firmly into the first cross-section. 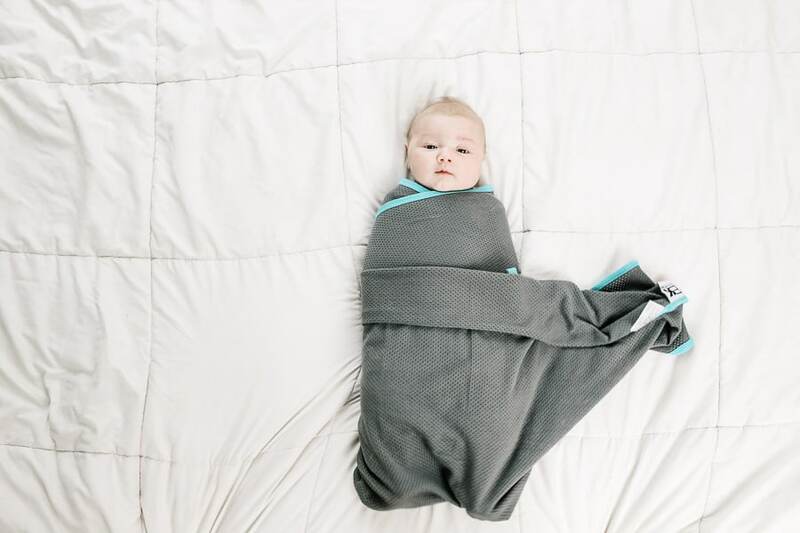 Alternatively, you can bring the bottom section of the swaddle blanket up and over the right shoulder, and tuck it behind the baby’s shoulder inside the back part of the blanket. Make sure the legs (and especially the hips) have room to move around. Step 5: Wrap the remaining part of the infant swaddle by taking the last corner and pull it snuggly across the body while pinning down the remaining arm. Another reason I like using the Baby K’tan Swaddle Blanket is that the material is stretchy which helps get a tighter wrap. Tuck the swaddle around the baby’s back, and tuck in remaining fabric if desired. And Voila! A cute and snuggly baby who is soothed by the feeling of security and warmth. One of the great things about delivering in a hospital is getting to see how different nurses do things, well, differently—and each has what they consider to be the best newborn swaddle wrap. And since newborns typically love the feeling of being swaddled after birth (it reminds them of the being in the womb), there were many occasions that nurses had to unswaddle to check vitals, and then re-swaddle when finished. I especially loved to watch how they swaddled Ensley because each one had their own technique (and a mama can use all the help she can get)! One of the nurses showed me a swaddling technique that I did not remember seeing before, and it quickly became my favorite way to swaddle while using a blanket for the first 2 weeks or so because it was fast, easy and held better than other swaddle methods (at least it worked for me and my baby). I never caught the name of it, but I started calling it the Boat Swaddle due to how it looks part way through (you’ll see what I mean in a minute!). The design feels secure and it creates a place to tuck in the remaining material, which is ideal for wrapping and carrying, or ensuring it will not break loose. So if you are looking for another way to swaddle a newborn, definitely give this one a go and see if you like it! Step 1: Lay the swaddle blanket down in a square shape. Place the baby in the middle at the top edge, with shoulders aligned with the blanket. 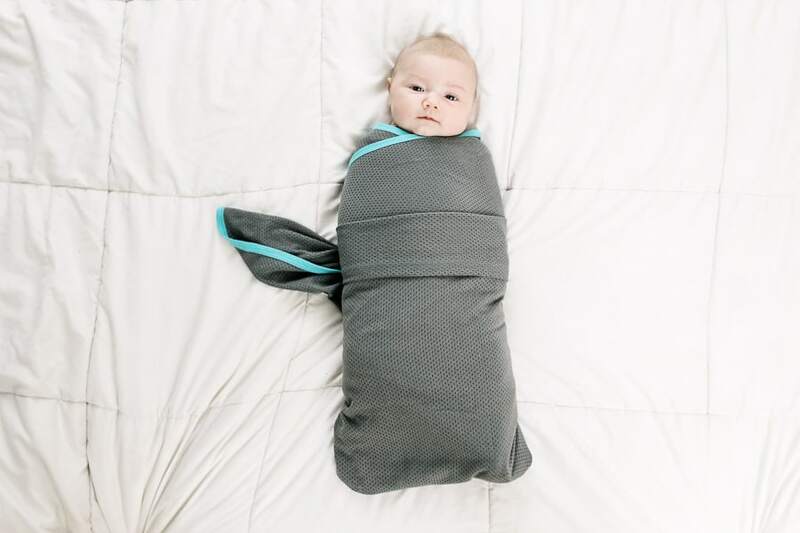 Step 2: Wrap the left side of the swaddle over and across the baby’s chest and belly, and tuck it behind their back (similar to the Diamond Swaddle). Once again check to make sure the blanket is not covering the face or too tight/loose at the neck. Step 3: This time, instead of taking from the bottom, take the blanket from the right side and wrap it securely across and behind the baby. There will be a lot of fabric left over down at the bottom. And that’s ok! We will use it in the next step. Step 4: Grab the two corners left down at the bottom of the swaddle wrap. Lift them up towards the baby, creating a fold below the bottom of the feet. Spread the blanket out to create two wings. Now step back and see if you can find why it is called the Boat Swaddle! Can you see it? Here is a picture showing what the bottom of the infant swaddle will look. Notice how the bottom half of the swaddle forms a bowl-like shape, while the top half forms the mast? That is why it earned the name Boat Swaddle! Step 5: Fold the top part of the lower fabric to create a neat fold that lays across the baby’s stomach/lower chest area. It will also rest over baby’s hands, helping to keep them snug inside the completed wrap. Tuck the left side back behind the baby’s back (and around to the front if excess). Step 5 1/2: Be sure to relax and make eye contact with your baby as they are probably laughing at you trying to figure out how to swaddle an infant for the first time! Just don’t their cuteness distract you from your goal of mastering the perfect swaddle! Step 6: Bring the remaining blanket material (from the right) back behind the baby, pulling to make sure it is snug. Tuck the tail into the pocket created by the folded layer. This secures the blanket and keeps the ends from coming loose. And that’s it! This one takes a bit of extra practice to figure out the wrap then fold process, but I found it easier to do quickly and it held more securely than other wrap techniques, making it my favorite! Small blankets may not have enough fabric to create a strong enough fold, but these blankets from Baby K’tan were perfect for leaving plenty of leg space for baby while having enough material to fold and wrap around the mid-section. I definitely recommend practicing before your baby arrives. While a teddy bear isn’t the representative (real babies move so much more) they are a great size to perfect your technique as much as possible before jumping in and adding a newborn baby to the mix! And just remember to not get frustrated when you can’t get it right the first time, or the first 10 times. 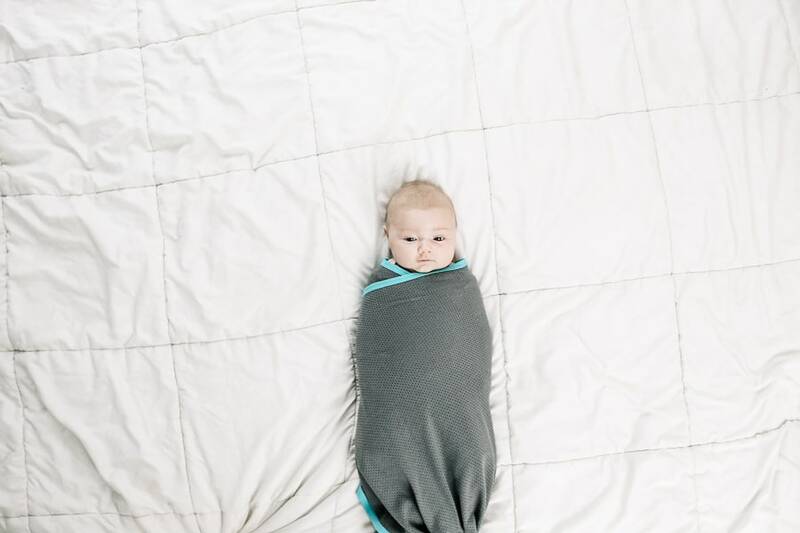 Swaddling takes practice, and just when you start to feel good at it your baby will probably start moving even more, making it difficult all over again! Take heart that you are doing the right thing to help them—and everyone else—get some sleep! 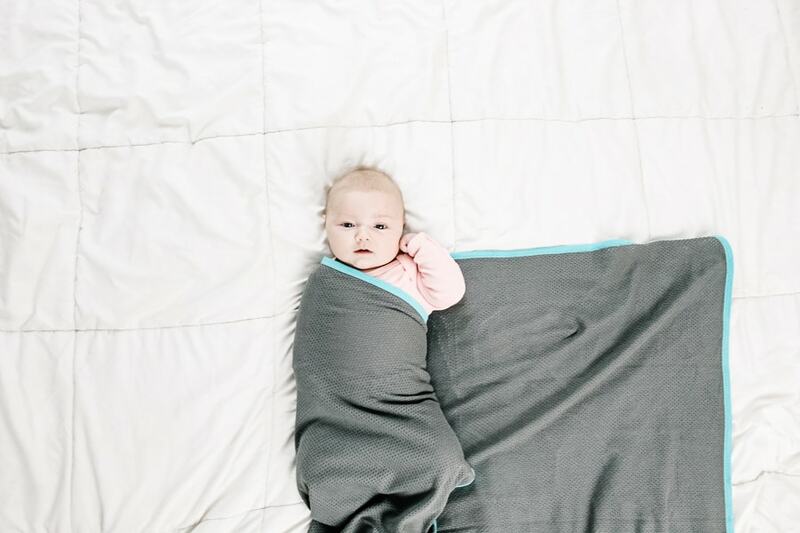 The great thing about having swaddle blankets on hand as I mentioned before, is that they can be used for so many different purposes, plus make a great blanket for toddlers too. Good thing the Baby K’tan Swaddle Blankets come in a two pack because Charlie is definitely always taking one for herself! You can buy them—and find more information about swaddling and babywearing—on Baby K’tan’s website, as well as on Amazon.com. Good luck making your own little baby burrito, and let me know if you have any questions!